Trek is one of the well-known global bicycle brands. This family-owned manufacturer design their (e-)bikes from their headquarters in Madison, Wisconsin, and has had some famous riders use their equipment over the years to great successes in the Tour de France, and many other great races. For their 2019 E-bikes, Trek has partnered exclusively with Bosch to build bikes with reliable and high-performing electrical components. 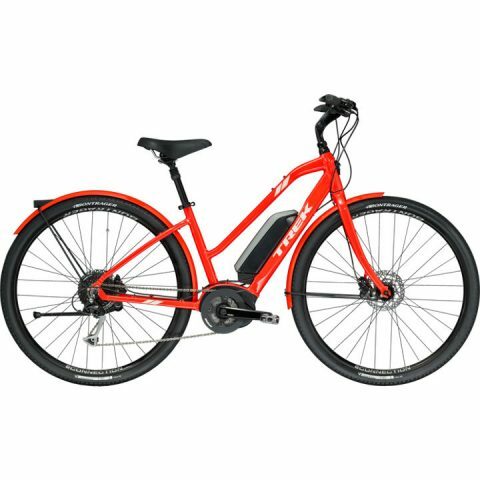 The Verve+ is Trek’s entry-level e-bike, featuring the 3rd generation Bosch Active Line drive unit as well as practical accessories like mudguards in the same colour as the frame and integrated lights. You’ll stand out from the crowd with the striking red colour!